Note: I’m posting this technically on Day 5. I was too tired to walk to where the Wifi was working in my little bungalow resort last night. My day started quite early: 2:44 a.m., to be exact, when a 6.0 earthquake centered not too far away rattled me from sleep. I got out of bed and went outside my bamboo bungalow, but no one else was up. The ground stopped shaking, and I went back to bed. I realized I’ve now lived in the “Ring of Fire” long enough to shrug my shoulders and not give it a second thought. And somehow, I woke up a few hours later feeling great. I decided to take a run through my hilly neighborhood while it was still relatively cool out, but afterward at breakfast I got wrapped up in conversation with a woman who had taken my yoga class two days prior. 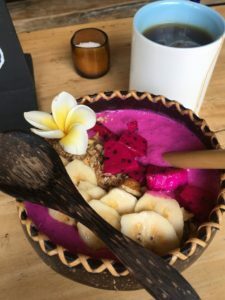 I realized I would be cutting it close to make it to the yoga class at Balila Resort, which was another venue participating in the Ocean Yoga Festival. I decided not to stress and took my time driving the 10 km from my place into Amed proper. I realized later this was a good move. I did my work at a coffee shop and had a smoothie bowl at Dread Light for lunch. While I was relaxing there after lunch, the person working there came up and said, “Hey, are you staying here? Because we’re going to leave.” And he and the other woman working there got on a scooter and sped off, leaving me alone in the restaurant. I looked around. There was a smart phone on the table, a box full of cash tips, all kinds of stuff. I had to laugh at their trust as I left cash for my food and left. Bali is pretty special like that. Last night, I had a conversation with a woman from Java who told me that there are ghosts in Bali, that this is something that locals believe. If you ever feel scared, that means there is a ghost nearby. You are supposed to tell the ghost that you mean them no harm and ask them to not harm you. You are then to ask them forgiveness if you did anything to upset them. It seems the worst thing you can do is complain. Ghosts don’t like that. So, I imagine if I had taken anything from that restaurant, it wouldn’t be the last I heard of it. 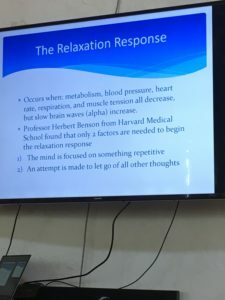 To initiate the Relaxation Response from meditation, you must focus your mind on something repetitive — anything — and make an attempt to let go of everything else. An attempt!! You don’t have to meditate perfectly for it to work! Yay! My first stop in the Ocean Yoga Festival today, then, was for the Ayurvedic Meditation workshop at Blue Earth. Now, I’ve always struggled with Ayurvedic medicine, a sister science of yoga, because the first thing you’re supposed to figure out is which of the three doshas is most predominant in you. Well, every test I’ve ever had clearly tells me I’m a fairly balanced tri-doshic individual. That’s actually good thing, except when trying to understand how Ayurvedic practices are supposed to help me. Well, impressively, I learned a lot about Ayurvedic practices in relation to meditation, and I really understood it. It was good practical stuff, with lots of experiential learning. I really enjoyed it. I had to leave a few minutes early, however; I got to teach SUP Yoga! You know how excited I was for this, and wonderfully my students were as well. What a fun afternoon class, with warm ocean waters embracing those in the class (present yogini on the scene included) who fell in. We got to watch the sun set behind Mt. 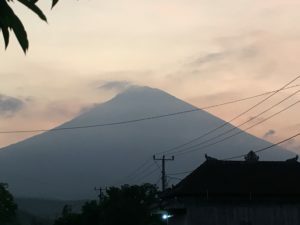 Agung, challenge ourselves with something different and bliss out with a fantastic savasana. Everyone in class said they loved it just as much as I did. My view on the way to ecstatic dance before I bit the dust and called it a night. That Mt. Agung sure is pur-tay! Afterward, I changed out of my wet clothes and hopped on my bike to head to Balila Resort for real this time to enjoy the ecstatic dance, which is another one of my very favorite things. I checked Google Maps and saw the fairly easy connection of backroads to get there. Well, the thing was, these backroads were not really roads. They were piles of sandy gravel and rocks that someone laid down in a general direction, and Google Maps was really being generous with the size of this line on the map. I spilled my bike going down a gravel embankment (grateful as I know so many who have been seriously injured on motorbikes – I just added to my collection of knee scars). Luckily there were a few men around to help me right my scooter. When I asked if I were even going the right way, one man told me to follow him. But he was going to lead me through a river, right next to where a man was taking a bath. I was suddenly very tired. I aborted mission, turned around and headed back home, where I ate a delicious meal and called it a night. Day 5 is the biggest day of all, at least for me … it’s my birthday! How amazing that my gift is a day filled with yoga, meditation, life coaching, learning and love!